﻿ What is Hot on Pinterest: Add A Special Glow With Gold Plated Lamps! Let your home décor shine with Gold Lighting Pieces! It’s Friday, it’s Black Friday and it’s the day of your favorite caption of the week: What is Hot on Pinterest! It seems that all the planets and stars are aligned to provide you the best day ever. Let your day (and night!) shine with these amazing Gold Plated Lamps we selected, and see where you can get them! This a great way to start this article: with an astonishing time machine disguised as a beautiful mid-century floor lamp. Janis Floor was inspired by the one and only Janis Joplin, and it’s one of the mid-century era ‘s classics. 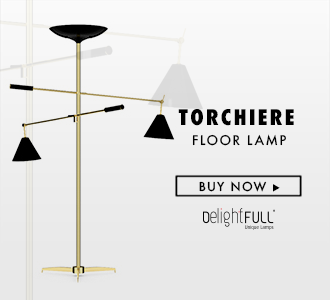 Handmade in brass, and aluminum, you can choose another finish, another type of bulb, and even the dimensions of this floor lamp. On Black Friday’s day, this beauty has a special offer that we bet you don’t want to miss! Another Brubeck on the wall! This is one of the classiest and more peculiar wall lamp design you’ll see. Handmade in brass, Brubeck Wall Lighting Piece is perfect to display on a mid-century décor. Ideal for hallways, however due to its simplicity and sophistication, it can be placed in any room of your house, and we’re sure it will blend perfectly. Parker Wall is has a similar design like Brubeck, however with a different symmetry, designed for all the design personal tastes. With an exquisite lighting effect, Parker Wall is one of the top choices when it comes to hospitality projects. The lighting fixture is an important feature of the décor, and we assure you that this particular one, will create the intimate environment you’re looking for! Gold finish will always capture the attention of our eyes, that’s why we’re fans! This mid-century living room with neutral colors such as black and white gain life with the gold plated lighting suspension pieces. The two types of lamps are both from the Brubeck Family of DelightFULL: Brubeck Chandelier and Brubeck Pendant, and, just like members of the same family, they get along pretty well in the same room! Sometimes details are what make the difference, aren’t we right? In this case, Hanna Wall Lamps gain a different touch with the contrast of the glossy white finish with the gold plated one. Ideal to display on your hallway with a great piece of art, or at the lobby of a hotel. READ ALSO: TURN THE LIGHTS ON! IT’S COLEMAN HAWKINS BIRTHDAY! What is Hot on Pinterest: Bordeaux As The Main Character! What is Hot on Pinterest: Gold Suspension Lamps and Where to Get Them!